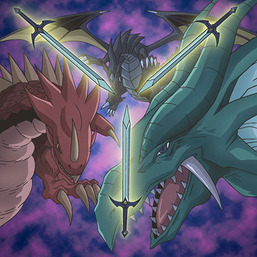 Clockwise, from top: "The Fang of Critias", "The Eye of Timaeus" and "The Claw of Hermos", in the artwork of "Legend of Heart"
"Legendary Dragon" (伝（でん）説（せつ）の竜（りゅう） Densetsu no Ryū) is an archetype of the dragon forms of the three "Legendary Knights". The archetype was introduced in Dragons of Legend and was featured in the Waking the Dragons arc of the Yu-Gi-Oh! anime. Despite all of the members of this archetype lacking "Legendary Dragon" in their names, they each include a name condition that causes them to always be treated as "Legendary Dragon" cards. The names of the "Legendary Dragons" come from the ancient philosopher Plato's workings. The specific body part in the name corresponds to where they were stabbed and sealed during the war in the Yu-Gi-Oh! anime. "Legendary Dragon of White" is not a "Legendary Dragon" card because it does not have 「伝説（でんせつ）の竜（りゅう）」 in its Japanese name. These cards first appeared in the Waking the Dragons arc of the Yu-Gi-Oh! anime. Yugi Muto, Joey Wheeler and Seto Kaiba each receive 1 of the 3 Legendary Dragon cards: "The Eye of Timaeus", "The Claw of Hermos" and "The Fang of Critias", respectively. According to Kaiba, the Dragon he received, "Critias", seemed just as powerful as the Egyptian God Cards. These cards are the dragon forms of the three "Legendary Knights" who used to live in the Dominion of the Beasts and answered Ironheart's call to defend Atlantis. Dartz transformed them into dragons to weaken them. The great ancient war ended in a draw, with the Dragons sealed away in their realm and the Leviathan severely weakened and diminished to a shadow. Although their names are known prior to their release in the dub anime, in the original anime, no one—not even the monsters—knows the names of these dragons except for their chosen Duelists, who learn their name upon releasing them, without even being told what their names are. Thus, they are referred to as the Nameless Dragons in the Japanese anime sometimes even by their chosen Duelists. In the anime, they do not belong to any regular card type; their cards are colored blueish, but not the same as Ritual Monsters. They can be played whilst "Spell Canceller" is on the field, so are not Spell Cards unlike in the TCG/OCG. They are usually played in Monster Card Zones, but Yami Yugi placed "The Eye of Timaeus" in a Spell & Trap Card Zone during his Duel with Weevil Underwood. "The Eye of Timaeus" can fuse with other monsters to become new Fusion Monsters. Yami Yugi fused this card with "Dark Magician" and "Dark Magician Girl" to form the respective Fusion Monsters: "Amulet Dragon" and "Dark Magician Girl the Dragon Knight". He once attempted to fuse it with "Poison Butterfly" but it did not work as at this point Yami Yugi had lost Timaeus' trust, because he played "The Seal of Orichalcos". The "Claw of Hermos" can fuse with other monsters to form new Equip Spells. Joey fused this card with "Time Wizard", "Red-Eyes Black Dragon", "Rocket Warrior" and "Big Bang Blow" to make the respective Equip Spells: "Time Magic Hammer", "Red-Eyes Black Dragon Sword", "Rocket Hermos Cannon" and "Big Bang Dragon Blow". In addition, Yami Yugi also fused "Queen's Knight" with this card to form "Goddess Bow". The "Fang of Critias" can fuse with Traps to form new Fusion Monsters with effects similar to the Trap Card. Seto Kaiba fused this card with "Crush Card", "Tyrant Wing" and "Mirror Force" to form the respective Fusion Monsters: "Doom Virus Dragon", "Tyrant Burst Dragon" and "Mirror Force Dragon". "Legend of Heart" allows them to transform into their Legendary Knight forms: "Legendary Knight Timaeus", "Legendary Knight Hermos" and "Legendary Knight Critias". These three Legendary Knights, under the right conditions, can also be combined to form "Timaeus the Knight of Destiny". Each of the Legendary Dragons can Special Summon one of a number of Fusion Monsters by using another card. In the TCG and OCG, only "The Eye of Timaeus" uses the other card as a Fusion Material; "The Fang of Critias" and "The Claw of Hermos" instead send the card to the Graveyard. There have been three official decks created by Konami.